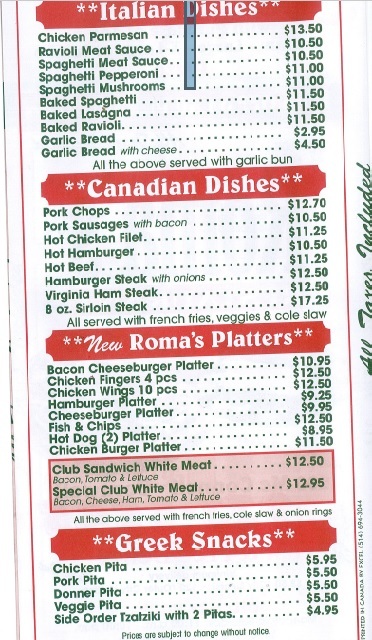 Roma’s Restaurant presents their online menu on CFN! 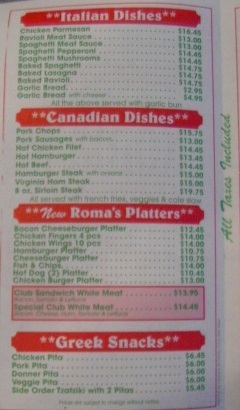 Call 613 933 5545 for fast free delivery and please mention you saw their menu on CFN! 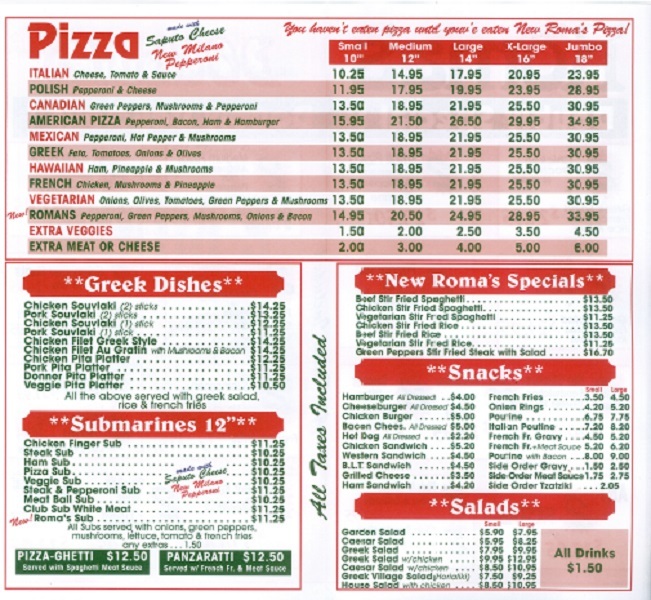 all Roma’s prices INCLUDE taxes! Make it a double and save! Hands down the best pizza in the city, in fact the best I have ever had!! And the cooks making the food in the back appear delicious too!!! Mr Pizza Lover I agree completely that it is BY FAR the very best pizza in Cornwall. 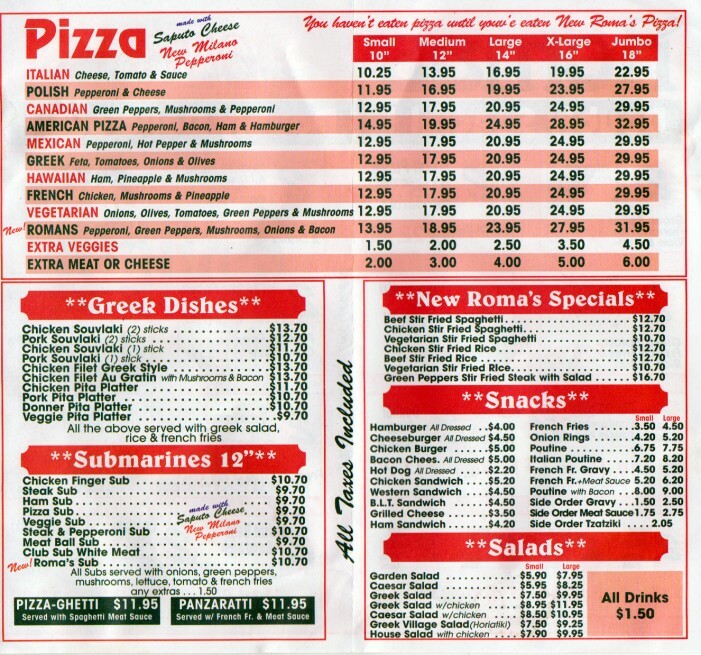 I moved to Niagara Falls a few years ago and I miss Jimmy and Manny and their fabulous pizza. They will always stay open late for me if I call them on the way, when and if I go down for a visit. 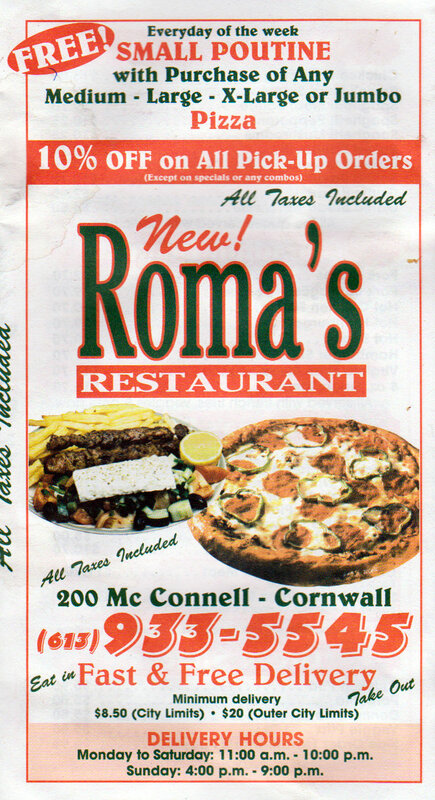 There are no pizzas like Roma’s pizza here, it is like getting served cheese on a cracker at area restaurants. 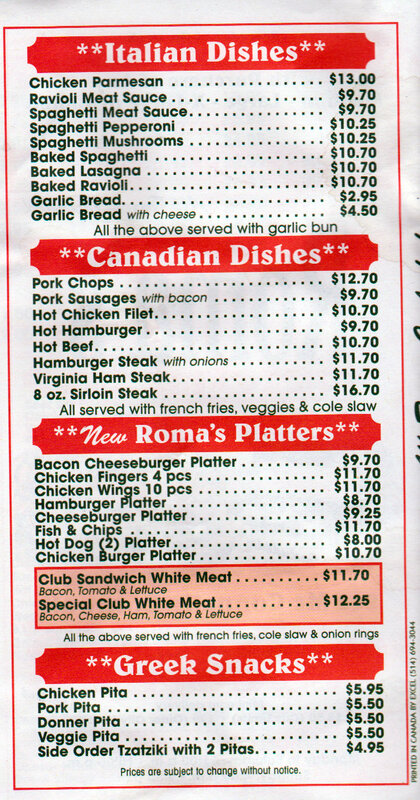 Jamie next time you go for lunch at Roma’s PLEASE be sure to say hello to everyone there for me. 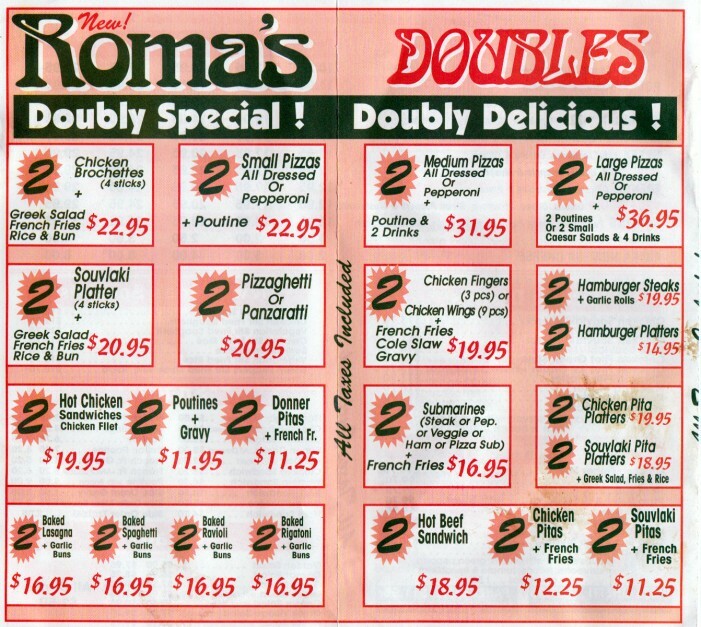 Romas makes the most fantastic Chicken Pita Platter!!!!!!!!!! Comes HIGHLY recommended!!!!!!!!! 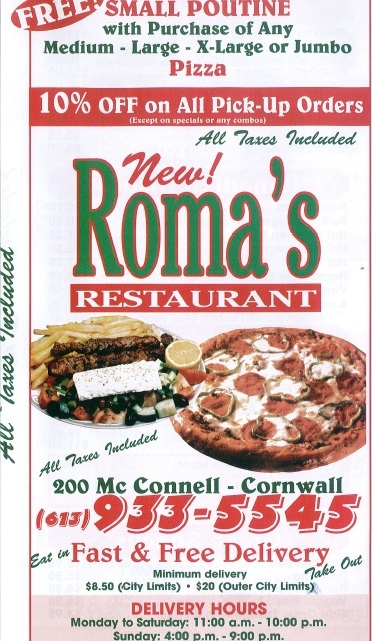 I’m new to this town and somebody I met the other day recommended I try Roma’s! So I decided to go there for lunch yesterday and I had a chicken brochettes with the taziiki and it was so good!! :) thank you new friend for telling me about this place it is my new favourite restaurant can’t wait to try something different next time!!! Ordered a medium special pizza over the weekend and it was so good thinking of ordering another one tonight!!! On top of the pizza I got a free poutine what a bang for your buck!!! 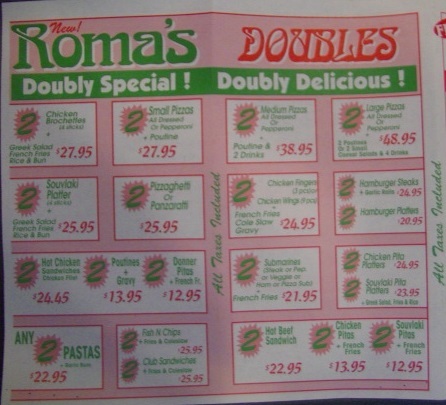 A few of my fellow workers ordered food from another restaurant today at the same time as I ordered mine from Roma’s , my food arrived 20 minutes sooner than theirs and mine was hot and fresh as there’s look like leftovers from the day before! 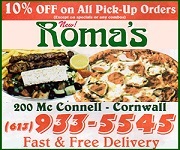 I’m not going to bash another restaurant name all I wanted to say was thank god I ordered from Roma’s!! 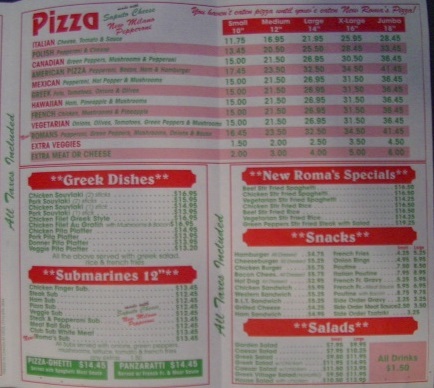 Good food reasonable prices thank you Roma’s pizza I will certainly recommend you to my friend! said, the Pizza was fantastic. 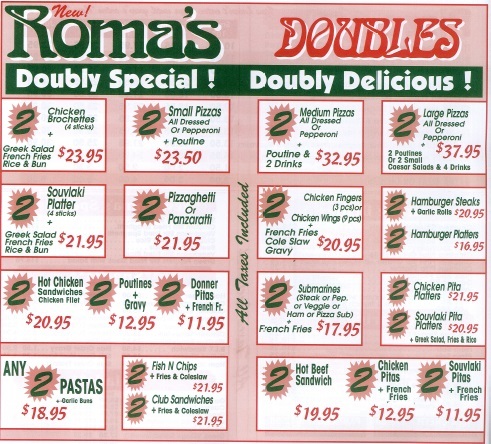 We went to Roma’s last night for supper. We haven’t been there for about two years, after my wife’s mother’s wake. It is very good and inexpensive. We’ll be going back soon.